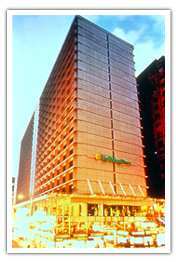 Holiday Inn Golden Mile - your number one choice for accommodation, dining, meetings and banquets. Ideally situated in the heart of both the entertainment and commercial business district of Tsim Sha Tsui, the hotel is surrounded by numerous duty free shops, boutiques, restaurants and discos and is easily accessible by MTR (underground railway), located adjacent to the hotel and the famous Star Ferry which is a mere 5 minutes walk away. The hotel itself stands proudly on the corner of Nathan and Mody Roads, with a sheer glass curtain housing the first two floors, where patrons can absorb the colourful surroundings of the streets below from several of the restaurants and bars.